Today is Day 3 of the Miss Polly blog tour. I have Jenn from A Jennuine Life, Maarika from Liivi & Liivi and Anke from Aamore sharing their dresses. Remember, throughout the tour (April 4 - April 15) you can receive 15% off the Miss Polly pattern with the code: MISSPOLLY15 (discount applies to all sewponyvintage patterns throughout the tour). Don't forget to use #misspollydress to tag your dresses on social media so I and others can find you!! Jennifer blogs at A Jennuine Life in the United States. She writes a blog where she shares her sewing for her two daughters and sometimes herself. 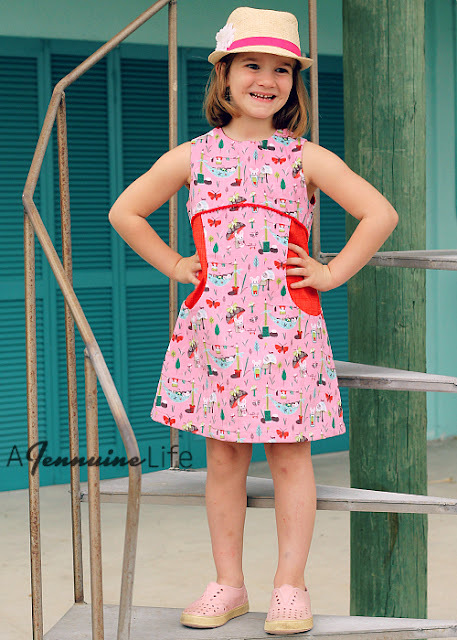 She has her own pattern line - Jennuine Design and has released lots of great patterns. You can see more of this sweet Miss Polly here. Maarika (Liivi and Liivi) was one of my fabulous testers for the Miss Polly dress (and the Dear Prudence dress) and she has sewn four Miss Polly dresses so far!! Maarika was not only a great tester but also helped in translating Miss Polly into German for me - thank you!! 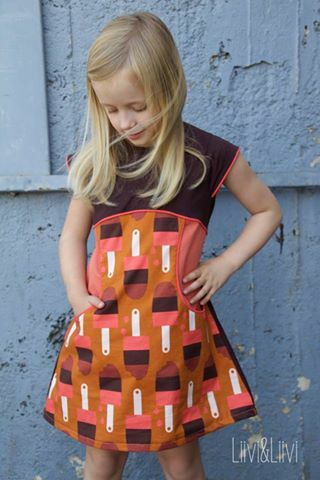 I absolutely love this ice cream dress she has made - the colours are fabulously seventies and I can't wait to see more at Liivi and Liivi. You can purchase the Deutsch version of Miss Polly here. Another of my fantastic testers was Anke from Aamore. Anke made two gorgeous Miss Pollys. You can see the first one here. The second one she made is beautifully pink and I have only seen one or two photos so can't wait to have a closer look. Anke has also been very helpful this week translating Miss Polly into Dutch! The Dutch version will be available by this coming Monday. Thank you Anke! Thank you Jenn, Maarika and Anke! Your dresses are all gorgeous! Miss Polly in Dutch? So great! I think I can manage the English version, but I'm sure it will be a great success!